Women Making Waves - Purchase your Tickets now ! One week from tonight join us for an inspiring evening for "Women's Making Waves: Global Women's Water Initiative Report Back from Africa". We'll share stories of the women who have transformed from being water bearers to water providers. These women who had never picked up a shovel in their lives are now building rainwater harvesting systems, toilets and water filteres which has resulted in the provision of clean water and sanitation to over 15,000 people in Uganda, Kenya and Tanzania. It promises to be a night of inspiration and hope! 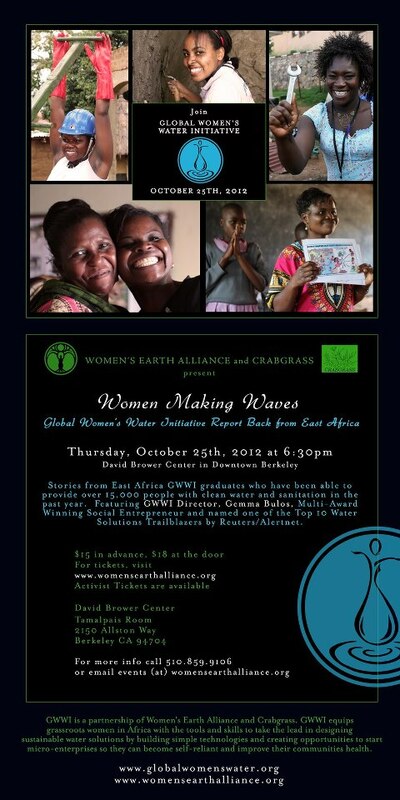 Join Women's Earth Alliance and Crabgrass as we celebrate the Global Women's Water Initiative and the amazing women who have changed the lives of over 15,000 people in East Africa. We will be sharing stories from these remarkable women who just over a year ago had never picked up a shovel and are now winning awards, challenging gender stereotypes, earning money, getting grants, chairing local water boards and improving the health of their communities! It's a night you won't want to miss.